The Eagles will need to go 2-0 against Washington. With their comeback win Sunday, the Eagles are 5-6, and believe it or not, they can take control of things in the NFC East next week when they face the Redskins at home on Monday Night Football. That's right. The downtrodden defense, the frustrating offense, and all your other favorite Eagles' deficiencies will have a chance to remain relevant as a playoff spot is within reach as the stretch run of the season approaches. Beating the Redskins, who will have a share of the NFC East lead, on Monday Night Football at home will be the biggest game of the season. A loss here could put an end to their playoff hopes. A win puts them at 6-6 and the Redskins at 6-6 with four games to play. If they can't win, they'd need to get a lot of help from the AFC South as the season drags on. The Cowboys will probably lose to the Saints, which helps, and creates a 3-way tie at 6-6 atop the NFC East (assuming an Eagles win over the Redskins, who have been decimated by injuries lately). For the time being, Dallas will hold the tie-breaker. The Birds will be in Dallas this week, and their game against the Cowboys obviously, will be for the division lead. A loss would require them to win against the Rams and Texans coming up, which is a lot to ask for if they want to stay in the mix going forward. A win puts them in the driver's seat. The Redskins will probably beat the Giants, which would get them to 7-6 as well, though you never know with the New York offense finally awake and producing. 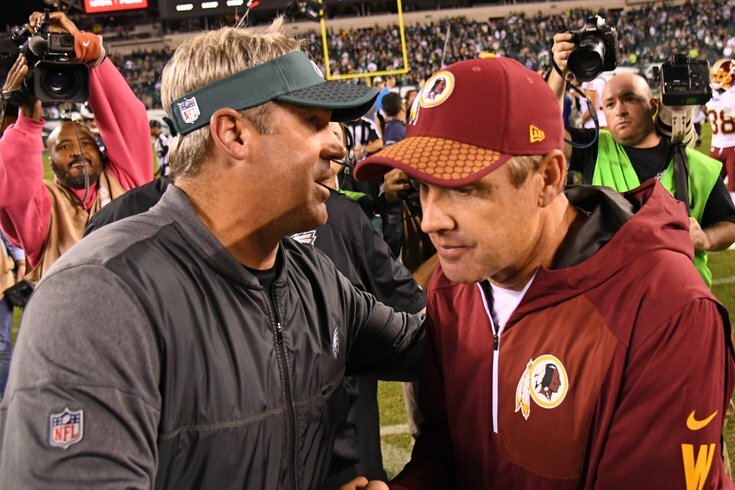 Assuming a Washington win, after Week 14, the Eagles and Redskins could be tied for first. If Dallas beats Philly, it will be the Redskins and Cowboys tied for the lead with the Eagles at 6-7. If the Giants and Eagles each win, Philly will be alone in first. We're going to be realistic here and assume the ridiculously talented Rams beat the Eagles in L.A. If Philly gets an upset here, it would be huge, but it's unlikely. We won't waste ink on it. This loss would drop them to 7-7 if everything follows suit. We are starting to get into scoreboard watch territory. The Redskins play the Jaguars and the Cowboys play the Colts. If the Eagles are indeed 7-7, they'd need losses from one or both of these teams for things to stay tight heading into Philly's final game at The Linc. Depending on how the standings are, the Eagles may be able to lose this game and still win the NFC East at 8-8. If they are able to win to get to 8-7, things will be looking up. If they lose and fall to 7-8, they'll need some help to make their season finale a meaningful one, most importantly a Cowboys loss. The Redskins aren't a big concern in Week 16. Win or lose, the Eagles can beat them in Week 17 to win a tie-breaker at 8-8 — though them losing to the Titans would be a big break. Philadelphia fans will need to be Buccaneers fans, as a Cowboys loss sets things up for the Eagles to win the division in Week 17. If the Cowboys win, they'll need to lose to the Giants in Week 17 with an Eagles win over Washington. If the Cowboys lose to both the Colts and the Bucs they won't be in the mix. If the Cowboys are able to get to nine wins with their Week 17 win, an Eagles win with the right tie-breakers would still clinch a playoff berth for them. If all three teams enter Week 17 at 8-7, the winner of the Eagles-Redskins game will determine the winner of the NFC East. The Wild Card situation seems out of reach barring some crazy win streak for all three NFC East teams, which is unlikely as they all play one another down the stretch. So there you go. Their miracle 25-22 win in Week 12 sets up a potential championship push. Whether the Eagles can lift their game above requiring a nail-biting comeback to beat the last-place, three win Giants is yet to be seen. But we've seen the Eagles make the playoffs before under tougher circumstances so you never know.